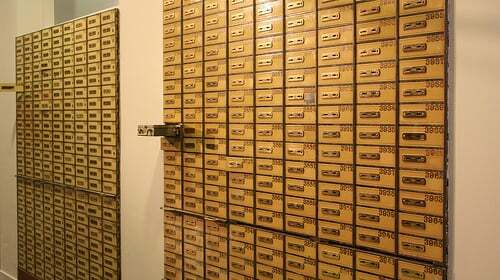 Finance Costs > How Much Do Safe Deposit Boxes Cost? If you have some valuable items you don’t want to keep at home, such as collectibles or jewelry, you may find that you want to head to your local bank to get a safety deposit box. The cost will depend on the size and the bank you choose. A small box can cost $15 to $30 per year, while a medium box, which measures 4 by 10 inches will cost $40 to $60 per year. A larger box can cost upwards of $180 to $500 per year. According to CBS Money Watch, the average safe deposit box costs anywhere from $30 to as much as $75 a year. Mint.com backs up these numbers as well. Bank of America charges $30 for a 2×5, $100 for a 10×10, and $190 a year for a 17×15. Chase Bank has over 60 different sizes to choose from. For example, a 2×5 can run $65 annually. Citibank has many various sizes as well. Here, a 2×5 is $20 a year and a 24×48 is as much as $3,318 a year. Wells Fargo also has different sizes. The 2×5 is $40 a year and the 10×10 is $120 a year. If you want to purchase one for your home, the SentrySafe H2300 ranges anywhere from $40 to $60, and the Digital Safe Box by Solar Eclipse can cost anywhere from $30 to $50. Wells Fargo $20 to $120 (individuals may qualify for free box with qualifying average balance of $5,000) $65 for 3x5, for instance. NOTE: The banks may offer other sizes. These are just the costs we found for some sizes. Safe deposit boxes can be found at all major bank branches. A safe deposit is going to protect your valuables such as jewelry, birth certificates and cash from potential theft, tampering, floods and damage. The boxes will be located at a local bank and will be securely stored in a restricted access area. Depending on the bank, you may be able to access the box with your fingerprint or a key they provide you with. You will only be provided access to your box during bank hours, which are typically nine to five during the week and varying hours on the weekend. The bank will more than likely assign you a key. While this key won’t necessarily open it, you’re going to need the bank’s key, your signature and even your fingerprint to access your safety deposit box. Some banks may require a key deposit fee. This is a fee to pay in order to get the key in the beginning, and this deposit fee can be anywhere from $10 to $30. Insurance is highly recommended for items outside of cash. Since the items won’t be covered by the FDIC or the bank, an insurance policy is highly recommended. Plan on paying $15 to $20 per $1,000 worth of valuables. It’s always safer to open up a safe deposit safe rather than have a safe at home. While home safes can be cheaper, they are a lot easier to crack if a thief does break into your home. Safe deposit boxes aren’t covered by the FDIC. If you’re going to keep any type of jewelry or any sort of valuable items, it’s best to have it insured by a separate entity. Talk to your insurance company or broker to see what’s covered. While it’s safe to keep papers in the box, always make sure that you keep copies at your own home just in case they get lost or something happens. Attorneys advise you don’t place birth certificates or originals of important documents; instead, consider keeping copies inside. To be extra safe, consider placing these documents in a Ziploc bag. People often include titles, detailed lists of account details, jewelry, stock certificates and family heirlooms. Finweb.com says you’re able to file this expense on your income tax return if you store your bond or stock certificates. It’s a good idea to let someone close to you know about this safe deposit box in case something were to happen to you. If you don’t pay your box rent, the property will be seized as unclaimed property. Consider installing a safety deposit box in your home. ThisOldHouse has a great installation guide on how you can install a safe. Make sure that your safe is bolted into the ground so it can’t easily be taken. If you’re already an existing customer with a bank, they may be able to offer you a discount.